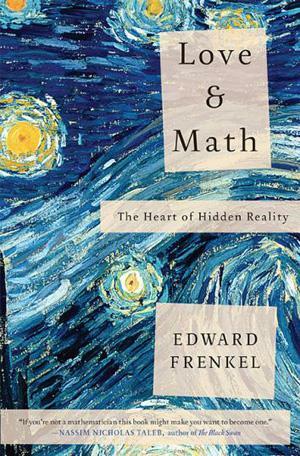 Edward Frenkel on Love and Math: What is it like to be a mathematician? Puzzles, paintings, bridges, and power. 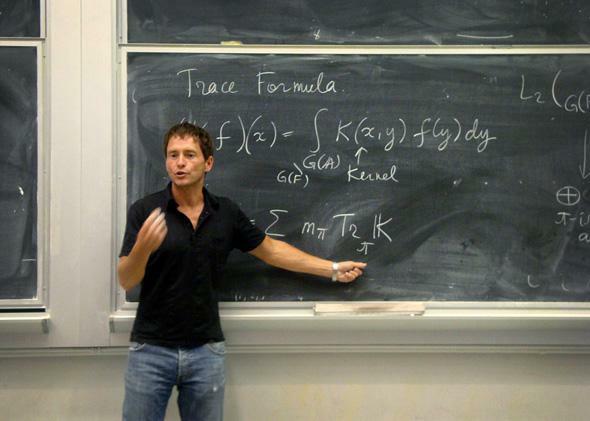 Mathematician Edward Frenkel speaks during a lecture on trace formulas at the University of California–Berkeley in 2010. Mathematician Edward Frenkel of the University of California–Berkeley wants to expose the beauty of mathematics, inspire awe at its power, and challenge his colleagues to wield it for good. His new book is Love and Math: The Heart of Hidden Reality. So what is it really like to be a mathematician? You don’t discover something beautiful every day. Most of the time, you work on something for weeks or months, only to realize that it doesn’t work. But you never give up, you go back and try to analyze the data that you have, and try to see the analogies and connections to try to come up with a new hypothesis. Then you try to test that. What is the ultimate goal of all these efforts? Another analogy is solving a jigsaw puzzle. Imagine that somebody gives you a puzzle, but they don’t give you the box, just the pieces. You take those different pieces and try to put them together to create something of value, something beautiful and powerful. You can think of mathematics as the grand project of building this enormous jigsaw puzzle, with different groups of people working on different parts. Then, every once in a while, somebody finds a bridge between two parts, a way to assemble pieces together so that big chunks of the puzzle connect. You work on the Langlands program, which aims to discover those connections. Why do we need them? It also reveals links between abstract math and the structures in physics. Could the entire universe be based on math? I believe that physical reality as we know it and the world of mathematical ideas are two separate worlds, and neither can subjugate the other. For example, we talk about the standard model of physics, which has been very successful in predicting a whole range of phenomena. Of course, the discovery of the Higgs boson last summer was a big trial for the standard model. But from a mathematical perspective, it is just one of a tremendous class of models. We don’t observe the others in our reality, but do they exist? Well, one can argue that they do in the ideal world of mathematics. How well does this ideal world connect to our real, physical universe? Sometimes you have some beautiful mathematics which comes out of the real world. We all know the story of Newton, an apple falling on his head. But another possibility is that within the narrative of mathematics, he discovered something about the real world. So, there is a sort of back-and-forth connection between the two. Neither controls the other. I think that the way to make progress in physics is to use this connection, to use experiments, but also to use the awesome powers that mathematics gives us to come up with new ideas. And that, I think, is a good illustration of this subtle interplay between the physical and the mathematical worlds. You were fascinated by math and quantum physics from an early age. How did growing up in Soviet Russia influence your pursuits? By the time I was 16 years old, I was very passionate about mathematics. Just a couple of years earlier there was someone in my life, a professional mathematician, who opened the world of mathematics to me, this magic, beautiful universe. He did for me what I now hope to do for other people with my book. But then there was a seemingly insurmountable obstacle. Because of some absolutely stupid policies of anti-Semitism, I was not accepted into university. The doors were closed in front of me. Yet you managed to carry on your studies? My career in mathematics, even much more perhaps, was saved by the generosity of my teachers—at the institution where I ultimately studied but also outside it. In some ways, I suppose this made me stronger, but I was lucky. I feel that I owe it to others to extend the same kind of help and maybe try to open doors, give access, the way I was given access. You have previously tried to convey the beauty of mathematics through film. Why? So much damage has been done in terms of the way mathematics is misunderstood by our society. It has essentially become impossible to talk to most people directly about it. With the film Rites of Love and Math, which I made four years ago with the French director Reine Graves, the idea was to penetrate some of those defenses—to talk about math indirectly by appealing to the emotional rather than to the cerebral. In the film, we show a formula being tattooed onto the skin, becoming part of the body, and we hoped that this would allow the viewer to think about mathematics differently. The best reward was when somebody from the audience would raise his or her hand and ask, “But what does the formula mean?” which was exactly the point. Do people really need to know about these formulas if they aren’t mathematicians? Recent revelations about the National Security Agency also show how math, particularly cryptography, can be misused. I think it’s very similar to the dilemma that physicists faced when they realized the power of the nuclear bomb. We are talking about a group of physicists who were just trying to understand the structure of the universe, the structure of matter, and inadvertently discovered this incredible power. I would not tell any scientist to stop his or her research because it might have some possible evil applications. But once you discover that it does have these applications, I think it’s also your responsibility to do whatever you can to prevent the discovery from being used for evil purposes. So mathematicians should take a stand? Mathematical power is not the power of a bomb. You cannot see its effect as immediately as Hiroshima and Nagasaki. But a formula can be just as powerful in terms of controlling our lives. It can alter the course of history; it can affect millions of people. I think we mathematicians are a little bit behind the curve. We are not fully aware of the Frankenstein that we may have already created or could create. I think that’s another aspect of this responsibility of mathematicians to take a more public role—to educate the public by giving them access to the beauty and power of mathematics.